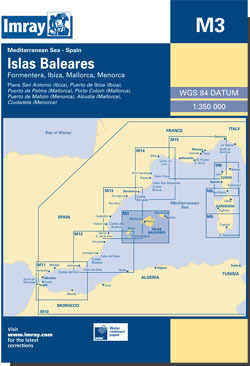 General chart of the Balearic Islands, showing Formentera, Ibiza, Mallorca and Menorca. Scale: 1 : 350.000. Larger scale plans of Puerto de Ibiza, Puerto de Colom, Puerto de Palma, Puerto de Mahon, and Puerto de San Antoni. On this 2018 edition a the chart specification has been improved to show coloured light flashes. For this edition the chart has been updated throughout using revised depth data. Harbour/marina developments are shown at San Antonio (Ibiza), Puerto de Ibiza, Puerto de Palma (Mallorca) and Ciudadela (Menorca), and new entrance buoyage is shown at Porto Colom (Mallorca).